Details: PUPPY/JUNIOR with fresh chicken and rice is for small and medium breed puppies and adolescent dogs formulated to meet the nutritional requirements for healthy growth and development. 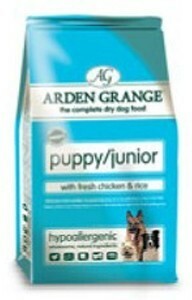 All Arden Grange products are hypoallergenic and free from wheat gluten, dairy products, beef and soya. They contain no artificial colourings, flavourings or preservatives.